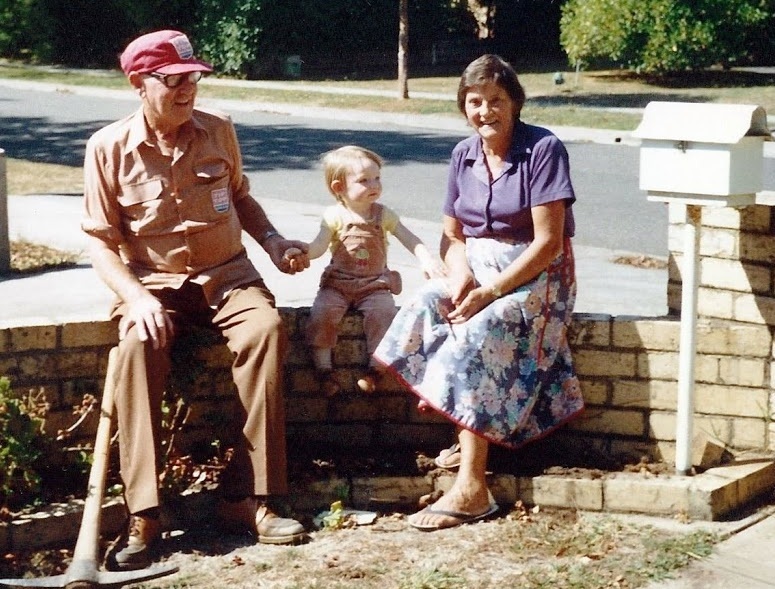 Round 1, 1995. This is the birth of the Fremantle Dockers, inducted into league footy at the spiritual home of the game, yet thousands of miles from their own home base. It was an inglorious beginning; an honourable 5 point loss in front of a smallish crowd in a scrappy match, as Richmond tried to encounter the foreign beast which was Fremantle’s short kicking possession game, a sign of things to come. The above pic is actually a few pictures from the day sewn lovingly together by my dad, and we can see Stuart Edwards about to goal with Peter Mann manning the mark. It will be on this very ground that the Dockers will strive for glory this Saturday, having matured and come a long way from the team which ran out for Fremantle’s first match. And those who are up in arms about the Dockers not wearing purple on Saturday, well it was a predominately green, not purple jumper which the Dockers began life in. Perhaps the umps will be in green to pay homage to Freo’s short past? History. Records. Come Saturday afternoon at the MCG, the players won’t be giving these two words a thought in the world and rightly so. It is the now that they must live in. 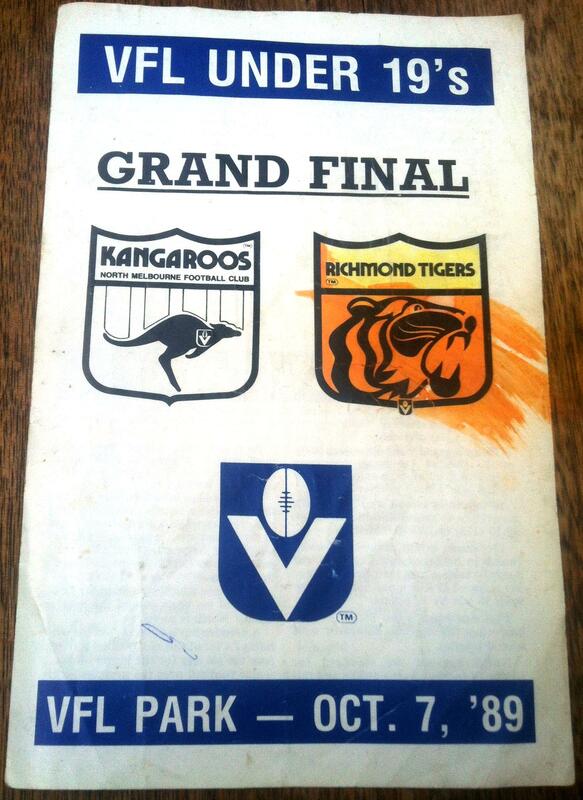 But alas, I am not playing in the AFL Grand Final, and therefore wish to delve into the past. Should Hawthorn win the 2012 premiership, they will break a long held, little know record. 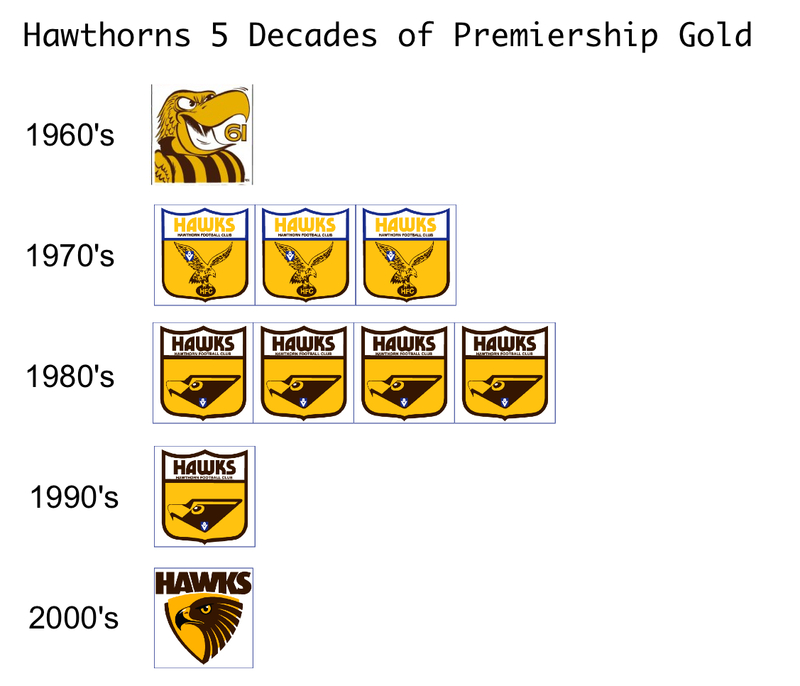 It has been well documented that Hawthorn has won at least one premiership in every decade since the 1960’s, which equals Melbourne’s record of 5 straight decades with at least one premiership (1920’s-1960’s.) Should Hawthorn overcome the Bloods on Saturday, they will become the first VFL/AFL team to claim premierships in six consecutive decades, a truly remarkable feat of sustained success. To illustrate, the three most successful clubs, Essendon, Carlton and Collingwood, have at best managed just four consecutive premiership yielding decades, giving an idea of just how successful the Hawthorn Football Club has become since John Kennedy took a hold of them and since they changed from Mustard Pots and Mayblooms into predatorial Hawks. What makes it all the more astonishing is the meagre beginnings of the club. Formed in 1902, the club unsuccessfully progressed through the Metropolitan league, the VFA and into the VFL, all with a bare trophy cabinet. 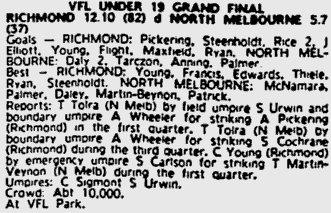 Once in the VFL, they spent the 1920’s-1950’s as a cellar dweller, and along with the other 1925 inclusions to the league, Footscray and North Melbourne, didn’t look like winning a premiership. 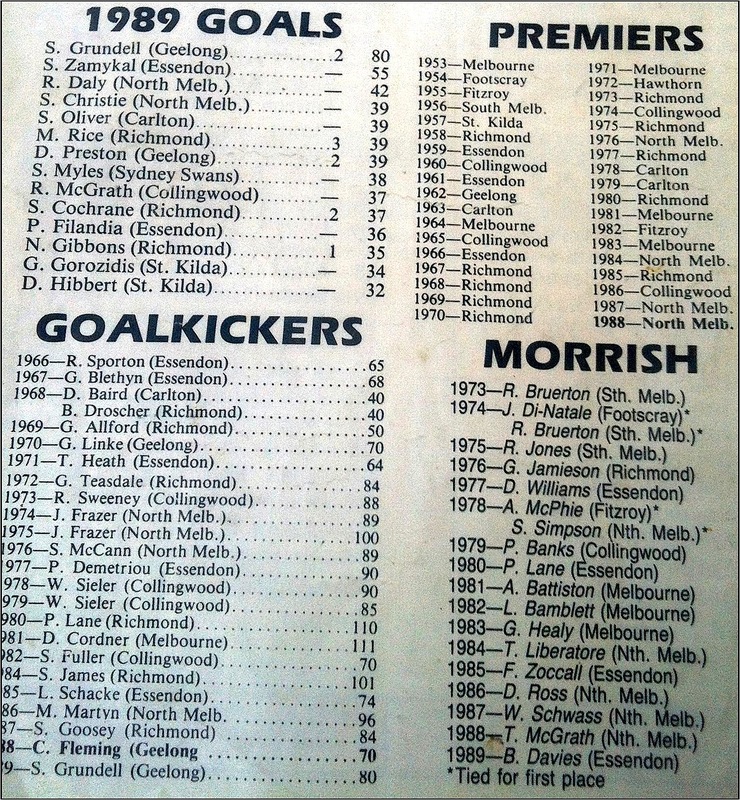 Footscray was the first of this trio to break through for a flag in 1954. But just seven years later in 1961, as both Hawthorn and Footscray met on the big day, it was the ‘underdog’ Hawthorn who were the sentimental favourites, winning their first flag and beginning an astonishing run of success. 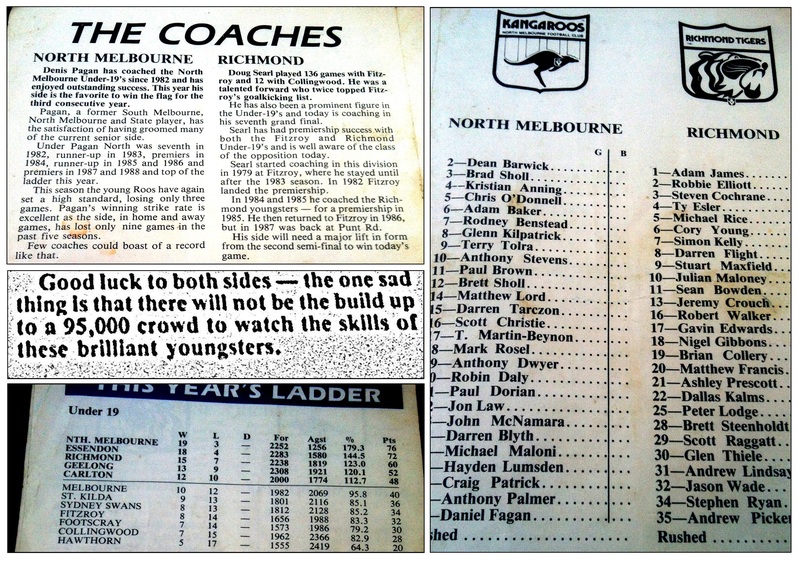 But they come up against a formidable foe in Sydney, also once the easybeats of the league. In fact the Swans (continuation of the South Melbourne into the Sydney Football Club) have undergone a transformation not unlike Hawthorn’s in the 1960’s. After six fruitless decades, surpassed only by St.Kilda’s 1890’s-1950’s drought, the Swans shed their easybeat image, internally rebranding themselves as the Bloods, leading to premiership success in 2005. 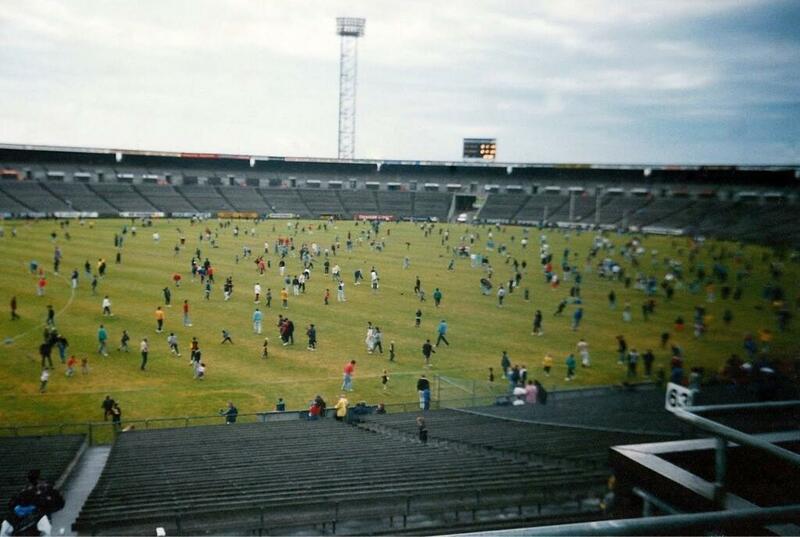 She’ll be a grand old game come Saturday. Thanks as always to http://www.footyjumpers.com/ for the Hawthorn logo images!